Entrepreneur or consumer? In his licentiate’s dissertation at Örebro University in 2011 the author treated that question concerning the main rule on the determination of the tax subject according to mervärdesskattelagen (1994:200) [i.e. the Swedish VAT act]. The problem then concerned in the first place whether that determination of who’s entrepreneur for VAT purposes is in compliance with the main rule in the EU’s VAT Directive (2066/112/EC) for the determination of taxable person, article 9(1) first paragraph. In this book the author continue with the same topic, but here’s the determination of the tax subject concerning one of the special rules in mervärdesskattelagen investigated That rule is to be found in Chapter 6 section 2 which partly treats the tax liability for partners in enkla bolag (approx. joint ventures) and partrederier (shipping partnerships), partly contains a possibility for the partners to let a partner as representative answer for accounting and payment liability regarding the VAT in bolaget or rederiet. By its character of special rule on tax and payment liability is the present rule – which in this book is called the representative rule – not of the same economical importance as the main rule to determine the tax subject. However is the representative rule of a significant economical interest. There are more than 7,000 active enkla bolag according to the Statistics Sweden’s (SCB) enterprise register. Furthermore there are hidden statistics concerning undetected enkla bolag. The representative rule is however of a particular law scientific interest due to it concerning a more classical law scientific problem, namely taxation and collection in connection with legal figures – enkla bolag and partrederier – which aren’t legal entities. The tax liability shall also in this case be in compliance with the main rule on who’s taxable person according to the EU’s VAT Directive (2006/112). By SFS 2013:368 was on the 1st of July 2013 the determination of the tax subject disconnected from the income tax act, and yrkesmässig verksamhet was replaced with the concept beskattningsbar person (taxable person). However, the Government and the EU Commission talk at cross-purposes concerning the criticism that the Commission presented in 2008 regarding the determination of the emergence of the right of deduction according to mervärdesskattelagen. The reform in 2013 didn’t mention the use of the concept skattskyldig (tax liable), instead of beskattningsbar person (taxable person), for that determination. The Commission might believe that the criticism has led to a solution by the reform, but the problem remains. A more holistic review of the use of the concept skattskyldig in mervärdesskattelagen is thus necessary. 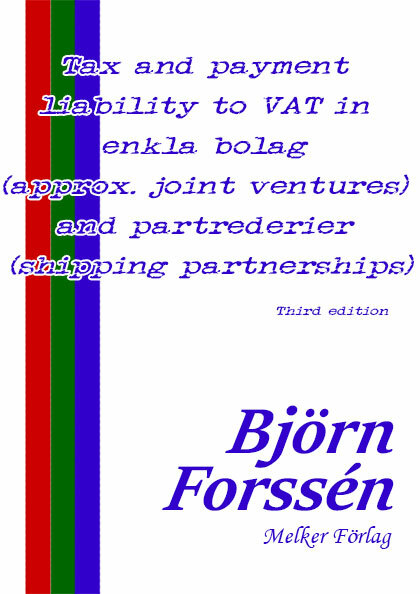 This book also proves that the particular problems which exist concerning VAT in enkla bolag and partrederier still remains after the reform of 2013 – these have not yet been mentioned by the legislator. In this book are rules regarded per the 1st of January 2015. The author, Mr. Björn Forssén, became Doctor of Laws on the 26th of April 2013 by this book, which in its first edition (both the first and the second editions were in Swedish) constituted – together with the licentiate’s thesis – a combined doctor’s thesis to receive the Degree of Doctor of Laws at Örebro University. You can find your own copy at, for example, Adlibris, Bokon, CDON and Bokus. Omslag – Entrepreneur or consumer?